Compass Bicycles and René Herse Bicycles are proud to introduce a modern version of the classic René Herse crank. The new crank will be available this fall. 70 mm bolt-circle diameter: Herse determined that a 24-tooth chainring was the smallest chainring that riders might want. This determined the bolt-circle diameter of 70 mm. All chainrings have the same bolt-circle diameter. Single, double or triple: One, two or three chainrings can be bolted to the spider. There is no need to buy new cranks if you want to go from a double to a triple chainring setup. Unlimited chainring combinations: Since all chainrings have the same bolt circle diameter, you can use any chainring combination from 24 teeth upwards. Most cranks today use bolt-circle diameters that make it virtually impossible to set up useful combinations like 48-32 or 46-30. Light weight: With only three arms on the spider, only three chainring bolts, and a smart overall design, the Herse cranks are very light, lighter even than carbon-fiber Campagnolo Record cranks. Low tread (Q factor): Most classic Herse cranks were between 130 and 140 mm wide, even with triple chainrings. Great reliability: Herse cranks have been ridden to world championships. They were used on tandems that climbed the 15% hill of the Poly de Chanteloup hillclimb race in the big ring. Over decades of hard riding, they have proven extremely reliable. Elegance: Highly polished, with a beautiful circle pattern formed by the arms and chainrings. 6066 forged aluminum arms: This alloy offers most of the strength of 7000-series alloys without that material’s risk of stress corrosion cracking. 7075 CNC machined chainrings: This high-strength alloy greatly increases the lifespan of the chainrings. The rings are clear anodized for protection against corrosion. JIS square taper bottom bracket: The curved arms use a shorter, and thus lighter, spindle (110 – 113 mm for double; 121 – 126 mm for triple). 22 mm extractor: The standard tool to remove the cranks is in almost every cyclist’s tool box. Compatible with 10-speed drivetrains. A little extra space between the arm and outer chainring provides room for the “sculpted” cages of most modern front derailleurs. Moving the arms slightly outward also keeps the chain from hitting the end of the crank in the largest gear with modern, wide cassettes. As a result, the new cranks’ tread (Q factor) is slightly wider than that of the originals: about 142 mm for a double. This still is lower than most cranks available today. The new cranks will be available in the Fall with a large range of ring sizes from 24 to 48 teeth. We will offer the cranks with single, double and triple chainrings, as well as a tandem model. This entry was posted in Cranks, Product News. Bookmark the permalink. Looking forward to this one! Thanks to RH and BQ for making it happen. I’ve been eyeing a 34 & 50 double lately, since I top out my current high of 48/11 on the commute. The simple answer is to just give up pedaling downhill, but there’s a lot of hills and a lot of the year it’s cold. 24 may be the smallest chainring people want, but I’d say stretch the other side for a 50 or 52 in there, especially since it’s available as a triple. We plan to expand the chainring selection further, and a 50 tooth large ring is the first on the list. We may be able to offer it from the start, otherwise, it will follow soon. Very nice! Have you determined a price range yet? Andy, I top out at 40mph with my 48/11 on fast group rides and that is fast enough for me……you have some impressive commuting skills! Any estimate on what a set with rings will cost? Certainly looks nice. We have not yet finalized the price. As with all our products, the emphasis is on quality, not the lowest price. That said, the cranks will be affordable. Good design does not cost more to make, it just takes more time to develop. There is a difference between “cheap” and “affordable”. I consider a SKF bottom bracket, Grand Bois tires and Nitto bars to be very affordable though none are the cheapest offerings in their respective categories. 1) Will the “R Herse” logo type be changed? It looks different than the slanted logo type I’ve always seen on Herse bikes. 2) Why not attach one of the chainrings directly to the crankarm as Campy and Ritchey have done? 1) The “R Herse” logos are exactly as they were on the old cranks. See today’s entry in the René Herse blog. The “slanted logo” was hand-painted on the down tubes, and it was different from the forged-in logo on the cranks. 2) On the C-Record and Ritchey cranks, the crankarm serves as one arm of the spider. I wonder what happens as the crankarm flexes when you pedal. On the Ritchey and C-Record, you have five arms to the spider, which provides a lot of redundancy. I could see the crank bolts coming loose on an Herse crank that used this design. Most of all, we did not want to mess with something that has proven itself over so many miles and decades of hard riding. Very nice! Any hints on the pricing? Our man in Taiwan visited almost every forging house and every CNC shop in the country before we selected the suppliers best suited for the job. They make forgings for BMW motorbikes and other high-end applications. Why Taiwan? Simply because that is the only place where the bicycle-specific expertise for making things like square tapers still is available. TA and, I believe, Campagnolo also have their forgings done in Taiwan. By working directly with our suppliers, we control every step in the process. We believe this is important to make sure that the quality is as we specify. Too many companies in Taiwan bid on jobs, only to subcontract them to China or elsewhere, with little concern about quality control. I hope that you guys have done a good job of product developement/engineering on these. While the famous labels also have work done in Asia, they have long, close relationships with people who know how to make these parts. BMWs are not bike parts. This product release should be informed by the insight you yourself have gained in reviewing the mediocre VO cranks and rings, which themselves had seemingly resulted from a close working relationship. The fact that some some metal has been organized into the shape of a crank or a hub does not indicate the successful build of a quality piece of gear. I share your concerns. The main point is that we do the design and testing, and leave the forging and CNC machining to our specialist suppliers. They know how to forge and machine parts, but it’s important that we provide the right specifications. The forging company also makes bicycle cranks – otherwise, they would not have the tooling to forge the square taper socket. Working with reputable companies rather than the lowest bidder provides some guarantee that materials aren’t substituted, etc. Lovely design. I have been hoping for the “reissue” of this crank. However, one has to wonder about flexure of the outer chainring; particularly with a strong rider and a large chainring. I imagine you’ve tested this. Please tell me it simply is not an issue. I have ridden hundreds of miles on original Herse cranks, but the historic record is even more convincing. These cranks were used on tandems, with teams that averaged over 30 mph for 65 miles. They ran 54-tooth chainrings on those tandems. A few decades later, Genevieve Gambillon won two world championships on them, and she was a sprinter with legs that were incredible. Basically, if those riders (and teams) had no problems, none of us will. When you look at the support of the rings, more arms get you rapidly diminishing returns. I’ll put up another blog post about this with illustrations soon. My concerns were not so much about the number of arms on the spider as the short radius of the spider arms themselves providing much less support for the rings. Nevertheless, your personal record and historical arguments are impressive. I look forward to more information, including illustrations. The TA Pro 5 vis chainrings have even less support, and they were used to win a number of Tour de Frances in the days when riders cranked big gears up the hills. The forces of the chain act mostly in line with the chainring, so it’s not a big deal. The Herse chainrings measure 4 mm thick, which is thicker than most modern rings. This adds stiffness. It may not be required, but since the originals were that thick, we figured we shouldn’t mess with something that has proven itself. Thanks for doing this! I am looking forward very much to the release! What length crank arms will be offered? Will you be offering the arms in a variety of lengths beyond what I assume will be the standard 170mm, say up to even 185mm for long-legged riders, as TA Pro 5 Vis were once available? Will it be possible to use clipless pedals with the new Herse arms? Yes. The pedal threads are standard (BSC). The arms may be compatible with modern 10 and 11 speed systems, but if the rings are noticeably thicker than most modern rings, will the rings themselves be equally compatible with 10 and 11 speed chains? The rings are thicker, but not the teeth. 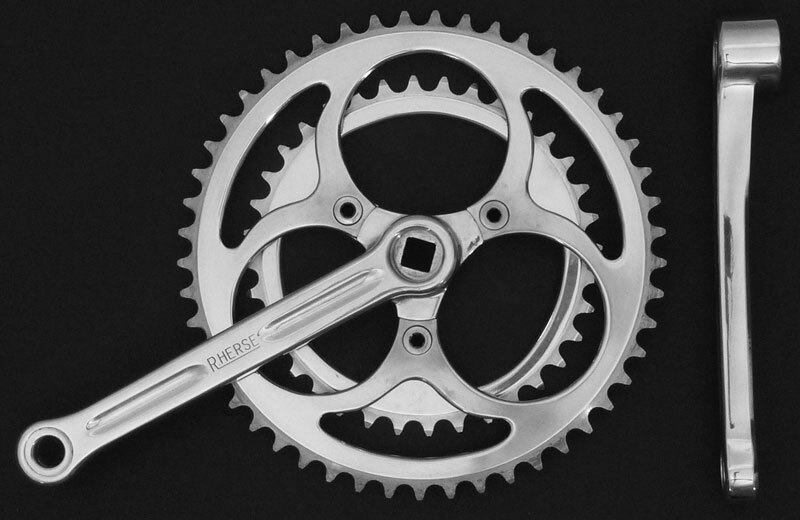 However, we are not designing the cranks specifically to be compatible with 11-speed chains. We have to draw the line somewhere, and we wanted to make sure the rings are compatible with old 5-speed drivetrains as well. 11-speed may work with some chains, but we cannot guarantee it. Will the chainrings be ramped and pinned? No. Pinned and ramped chainrings only work as pairs. For example, when you look at a modern 50-tooth chainring from Sram or Campagnolo, you’ll see that the it is marked “50/34.” If you set up that 50-tooth ring with a 39-tooth inner chainring instead of a 34-tooth, the ramps and pins won’t do anything. Developing pins and ramps that work is a big undertaking, which is why most big makers offer only a few chainring combinations. On aftermarket rings, the pins and ramps are just cosmetic. Fortunately, old-style rings shift just fine. Even well-designed pins and ramps do very little. We like the versatility of being able to use the chainring sizes you need, which is why we’ll offer more than a dozen ring sizes from the start. If we wanted to make dedicated pairs of rings, we’d need three times as many rings and ten times as big an R&D budget. And cosmetic pins and ramps are counter to what we want to offer: honest performance. What crank arm lengths will be available? Initially, we’ll offer a length of 171 mm. Making several lengths from the same forging is a bad idea, as the machining weakens the crank. We may offer more lengths in the future, but if we do, we’d want to make new forging dies, so that the crank remains a “near net” forging with perfectly aligned grain structure. I am working on a blog post on crank length – stay tuned. Drat! I’m short-legged and 165mm seems to be my ideal length. Hopefully we’ll see 165mm coming along at some point. I will look forward to this crank set… when it has a 165mm crank arm option. I’m also curious about the length of crank arm. By some formula, I will need a 160mm crank arm. But I have doubts on such a formula (whether it can be linearly scaled). Yeah! 171mm is a perfect length. Bonjour, does rings will be available as spare parts ? Price ? Does it fit original 70’s Herse cranks ? Hope for positive answer ! The chainrings will fit original 1970s Herse cranks. The price has not been finalized, but the rings will be affordable. Toothless larger chainrings would be a nice option for 1×5-6-8 porteur style bikes where a chain guard or case is not desired. I (or most bicycle-related machine shops) could turn the teeth off of a larger chainring for you. It sounds extreme to remove teeth from a brand new chainring, but it is probably cheaper than making a small quantity of toothless guard rings. I’ve done this many times to 110mm BCD rings and the results are good. I just might take you up on that Alex. Currently using an old TA single speed cross ring and plate with Nervar arms. I was thnking about replacing the nervar with a set of re-issued TA arms but will now hold off a while to see where pricing on these falls. Jan, thanks for getting these into production. I’ll certainly be replacing my VO cranks for these when they’re available (along with an SKF BB). These cranks and their versatility makes so much sense. On somewhat of a different subject, any chance of Compass producing quality 6 speed freewheels? Nice work. Now if only we could have a set of RH cantilever brakes! Older cranksets of the same era as the Herse had 3 arms, i.e steel cottered, even Campy when they went alloy at one point. There must have been a compelling engineering reason other than aesthetic to do so. Oh, good, I’ve been waiting decades for a crank that would fold my chainrngs in half when a single bolt worked loose. Now I can be just like my younger self again! Rather than design redundant bolts, we are making sure that the crankbolts are strong enough that they don’t break or strip when you tighten them properly. Then they should never come loose or fall out. I’ve ridden spidered cranks for over 27 years, and I’ve had precisely zero chainring bolts work themselves loose. Usually I have the opposite problem–modern aluminum ones tend to gall in place because I rarely pull the rings (once every few years to replace the outer chainring). Is losing a chainring bolt a common problem for cyclists? I lost a chainring bolt when I used aluminum bolts in a misguided attempt to save weight. When I lost the first one, I tightened the others, and immediately broke two of them. Clearly, there was no torque setting that was high enough to prevent them from loosening, but not so high that they’d snap. I went back to Campagnolo steel chainring bolts, and never had a problem again. That is also a reason why I like the Herse design. It uses three standard-size chainring bolts. Being only three, they weigh very little, and there is no temptation to make them from aluminum. We won’t even do stainless, but chrome-plated 8.9 steel. That way, you can tighten them enough that they’ll never come loose. Any chance there is Nivex derailleur in the future for Compass Bicycles? Hogwash! You’re trying to make your crankset “weigh very little” by removing 2 screws? Or are you actually just trying to differentiate your new cranks from the current leader in retro-styled compact doubles and low-q triples, Velo Orange? Conveniently, you can reintroduce a proprietary (dead) BCD and become the only source for chainrings. Do you plan to be around a couple decades from now to provide new rings? Why not a 5-pin 74 bcd crank? 74 supports 24t rings, and then at least some rings would be available elsewhere. Larger diameter and extra fasteners would mean more stiffness, a minute difference, maybe. Regarding the availability of chainrings, we plan to be around in the long run. We chose this design because it is classic and proven, and “planned obsolescence” is not part of our strategy. If you try to find 7-speed cassettes today, you know what I mean. The same arguments were leveled against 650B, and today, there is a great selection of 650B tires. Basically, if enough people use something and like it, there is demand, and somebody will supply the parts. Using a 74 mm BCD (commonly used as the “granny” on mountain bike cranks) is an interesting idea, but it still would make us the only supplier of chainrings larger than 36 teeth. It doesn’t make sense to compromise the design and still use proprietary chainrings. This surely is an interesting and welcome offering. It is too early to say if these cranks solve the compatibility issues that some have reported with the Velo Orange Grand Cru cranks, but that is obviously crucial. They look beautiful, and any gram saved is a gram saved. At the same time I am less than pleased with the BCD. I regretted the 50.4 of the VO cranks, and these Herse cranks are even less compatible with easy to get rings. I still think that an ultra compact double with a 74mm inner bcd and a 110 mm outer would have been the simplest solution to have a niche market crank that uses off the shelf rings. Anyway, this is what we get, and I am sure they are what I will order for my new bike (171 mm is perfect for me, but my wife will have to look elsewhere). What remains is the issue of the FD. What double FD do you think will work well with a modern 9-10 speed cassette and e.g. 40-24 t rings (to pick the most extreme example)? The biggest issue is aesthetics – the curve of modern derailleurs is matched to the radius of a 50-tooth or even a 53-tooth chainring, so it looks a little strange with a 44-tooth ring. My Urban Bike has a 42-tooth big ring and a Simplex derailleur that doesn’t match the radius of the ring, but I have got used to it. The alternative is a custom front derailleur along the lines of the old Herse or Singer – like the one on our Pereira Randonneuse test bike. a 24t chainring, smallest anyone might need… was it because back then the biggest cog available on a freewheel oonly a 26 or 28t? and anything bigger like a 32 or 34 would exceed the capacity of derailleur of that time, the Nivex comes to mind? or was it a weight saving strategy? small steel cog small alloy ring weighs less than large steel cog larger(than 24t) ring? I can’t help but wonder if the 3 arm design worked so well, why did Campagnolo only used it for their cheaper model? fwiw, I onced had a 1953 Bianchi Tdf with a 3 arm steel crank, steel rings, stiff and just as light as a typical NR alloy record set. I weighed it. However it had a larger bcd. Any case, while I would never need to use a 24t ring, I’m intrigued with the Herse design and would probably try it. I think that with 4- and 5-speed rear derailleurs, using super-large cogs like 32 or bigger simply made the steps between gears too big. So back then, 24 teeth generally was the maximum, perhaps with a few 26-teeth freewheels for those who needed very low gears. For loaded touring, you really need a lower gear than 32-24. A 24-24 with 650B wheels will get you up most hills, even with a camping load. Most Herse bikes were set up with larger gears for randonneuring or racing, but there is little disadvantage in having the possibility to go to lower gears, if you need it. The choice is whether you want the ability to ride slowly up hills at a normal cadence, or whether you want smaller increments to the choices of gearing on everything else. For a bike designed for long days in the saddle on rolling hills, I’d much rather have smaller gear increments than loose that ability just to climb hills at a high cadence. The beauty of the René Herse cranks is that we can accommodate everybody’s needs. Back in the old days, the racers used these cranks with 50-47 rings, then later with 52-42, while the randonneurs often ran 50-34 or similar, and the tandems for loaded touring could go as low as a 44-34-24 triple… Everybody’s pedaling style is different, and so are their gearing needs. Quality is remembered long after price. I notice that the Velo-Orange blogpost didn’t give credit to the conversation with Jan.
Jan has fully demonstrated his leadership in returning to a line of bicycle evolution based upon his authentic interest and involvement in not just a superficial “retro” aesthetic, but a distinct form and attitude of bicycle usage. I respect his continued integrity. His interest in bicycles has coincided with mine and improved my enjoyment of bicycling. Thanks Jan! Oh my God these are beautiful, and the specs look extremely appealing. Don’t know what else to write, just Aaaaaaaahhhhh! I hope your polishing/anodizing is better than VO and the strange purplish sheen. Jan said: I think that with 4- and 5-speed rear derailleurs, using super-large cogs like 32 or bigger simply made the steps between gears too big. So back then, 24 teeth generally was the maximum, perhaps with a few 26-teeth freewheels for those who needed very low gears. That might have been true in the days of 4-speed freewheels (before my time!) but by the 1970s, the most common 5-speed freewheel was the 14-28, and even the racing-oriented Regina Oro was available with a 31 tooth sprocket (I had one on my 1972 Paramount, as delivered). Sun Tour 5-speed freewheels often came with 32T large sprockets. The 24-tooth small chainring has been the lower limit for most applications. Not just when Herse developed his cranks in 1938, but also with the traditional mountain bike cranks from the 1980s onwards. Will the new crankset ever be sold in parts? For example, someone wanting to purchase another crankarm or a different length crankarm and they originally purchase the set already? Being a small company, we can accommodate many special requests. So if you need a part, you will get that part. I have really enjoyed your products and, of course the newsletter. I just hope that someday you will make this crank with 175 arms. 48-32 would be perfect for my “Roadeo”. I´m interested in a crankset for my Randonneur bike with front and rear panniers and a handlebar bag. Do you recommend a duble or triple for this setup? The bike is going to be used as a fast Touring/Randonneur bike in the same style as the Gouland Campeur from the 1950´s with 650 B 42 mm tires. When are the cranks going to be availble, is it possible to use a modern camp or Shimano Dura Ace FD, or do I have to look for an older one? The new cranks should work with most modern front derailleurs, so no need to look for an older one. Double or triple? That is a question of personal choice. It depends entirely on the gear ratios you need, and where in the gear range you prefer to ride. I don’t need very large gears, so I can use a “big” ring of 46 teeth, which allows me to ride in that ring most of the time. If you need much bigger gears, then a triple can be useful, as the middle ring allows you to ride most terrain without front shifts. There’s one thing missing in your list of key features: the chainrings can be replaced without removing the crank from the bottom bracket first, which is not possible on 50.4 BCD cranks like TA Pro 5 Vis, Stronglight 49D etc. Yes, that is a feature, but I am not sure it is an important one. For racers who may change their gearing for each stage, maybe. Randonneurs who replace their chainrings when they are worn probably also should take off their cranks to examine them for cracks and to check the bottom bracket. um, I’ve never had a problem removing worn-out chainrings from a 50.4 bcd crank with it installed on the BB. looks lovely! I’m very interested in the triple as a disabled cyclist. Sometimes I really need that granny ring. For loaded touring I think you really want low gears. However, with these cranks and modern cassettes you can still have that with a double. 24 teeth at the front and 30, 32 or 34 at the rear is what you would need, and that will be fine. So the difference with a triple is at the high end: do you want a higher gear than 40 front 11 rear? Personally I rather like ultracompact doubles. You use the big chainwheel for flat parts or even short and not very steep climbs. So it is a simple alternation. What I do not understand is why you seem to take this much on a fast tourer/ rando bike. For such trips I think going ultra light is much better. On camping trips I rarely take more than 15 kg in one set of panniers, and less is quite possible. Overloading a responsive bike with fast and light tyres defeats the original idea, I think. Thank you for your comments, This is my first full custom Randonneur project. Allright so you reccmend me the compact like 48 x 24 in the front and a modern 9 sp cassettte like 11-32. The bike is going to be a fast Randonneur bike.I´m going to use it with a Gilles Berthoud handlebar bag and a small pair of their panniers (their 1500 in front and a pair of small 1488 on a rearrack for longer trips) Or is it better to use the 1488 bouth front and rear? http://www.flickr.com/photos/49353569@N00/5596271295/ The bike is going to be designed for the next PBP. I’m not sure you can use 48 & 24 with a double. I can’t remember how big a step a typical derailleur can go, but a 10-12 tooth jump is fairly typical, I think 16 is still okay since I’ve seen 34 & 50 doubles, but 24 might be over the limit for a double. I haven’t been able to find a specific answer to this yet. Anyone know? I ride a 48-32 on my Singer, so 16 teeth does not pose a problem. Many compact doubles are 50-34, which also is 16 teeth difference. I haven’t tried larger steps than that. With a double chainring and a 9-speed cassette, how many gears are “cancelled” because the chain line is too bended? Same question with a triple one. In the technical trials and at the Poly de Chanteloup hillclimb race, points were deducted if any gear did not work. In my testing, I have found that on cyclotouring bikes with relatively long chainstays, you can use every gear if the chainline is set correctly. The chainrings may wear a bit more quickly when the chain bends, but it is not a big problem. I generally try to avoid the two extremes. The extremes would be overlapping gears in any case. The thing to do, therefore, is to make sure that the point where the two ranges of the front chainwheels overlap is not in your most common gears. What I like about a well chosen ultra compact double is that in flat or undulating country you basically ride on the big front, shifting only at the rear. You only use the small front for the more serious climbing. So the front chainwheels should be relatively small to allow this (42/26 or even 40/24). A 40 ring with a 11t sprocket will give you a highest gear of 95 inches. A 42 ring wil give you 99 inches. For me at least that is more than enough. Stronger ides can fit larger ring combinations, of course. Luggage makes a big difference, however, Road racers and rando riders can easily be too optimistic about he lowest gear they need when touring with camping gear. When exactly, I need a set. So do I! But we won’t rush the final steps toward production. Quality comes first, even if it takes a bit longer. Love the crank! Very convincing arguments on strength and longevity but I would like to understand more about why ramps and pins only work with paired chainrings. This would seem to make sense if both rings have ramps and pins, but my crank only seems to have them on the large ring. Does this mean my ramps and pins are ineffective? I looked at the SRAM Red chainrings on a test bike, and it also has ramps and pins only on the big ring. That makes sense, as the big ring is the one that needs to lift the chain or drop it onto the small ring. However, the ramps and pins on the big ring need to be specific to the path the chain takes, and that path is different depending on the size of the small chainring. Thus, the big ring usually is marked for both its own size and that of the matched small ring. If yours doesn’t spec the size of the small ring, then most likely the pins and ramps don’t do anything. That isn’t a problem, as chainrings without pins and ramps shift great, too.